Tara and I drove into Portland yesterday to pick up a few things (an $11.45 bag of Jacobsen sea salt, a bottle of Wild Roots Marionberry infused vodka, a package of smoked steelhead trout – god, we’re weird). While on Sandy Blvd. we drove past a huge vintage store we had never seen before and decided to stop in. This place was great! In addition to a million knickknacks, including more than a few lava lamps, they also apparently bought out an old clothing/costume store and there were all kinds of groovy outfits. I really, really wanted to buy a yellow ruffled tuxedo shirt and houndstooth jacket just because, or maybe to wear to the upcoming office holiday party ironically, but we didn’t have a lot of time to browse so we will have to go back sometime and invest a solid hour or two for looking around. Along the way, we passed this car. Guess you’d call that a tree-cylinder, huh? Oh, Portland. I love you so. On the way home there was a woman on the side of the road selling homemade tamales out of a cooler for $5 each. “You just know those would be the best tamales you ever had,” Tara said, and I was tempted to stop but I had already passed her by and we really needed to get home so I could start cooking, as we were having my parents over for dinner. Come to think of it, I should have just picked up a bunch of tamales and served those – would’ve saved me a heck of a lot of trouble, huh? But I was already planning on making enchiladas and guacamole, so we just stuck with that. I’m tempted to drive back over there sometime and pick up a few, though. The dinner turned out very well. Doing it all from scratch, right down to the enchilada sauce, is a lot of work but definitely worth the effort. Our apartment is all decked out for the holidays and we had Christmas music playing, so it was very festive. Audrey and her girlfriend were there too, so that was nice. After dinner my parents went home and we watched my favorite holiday movie, National Lampoon’s Christmas Vacation. Tara made popcorn and it was a grand ol’ time. I was itching to get out of the apartment today and Tara had some stuff to do, so I took an impromptu drive into the Gorge. The weather was very dramatic. 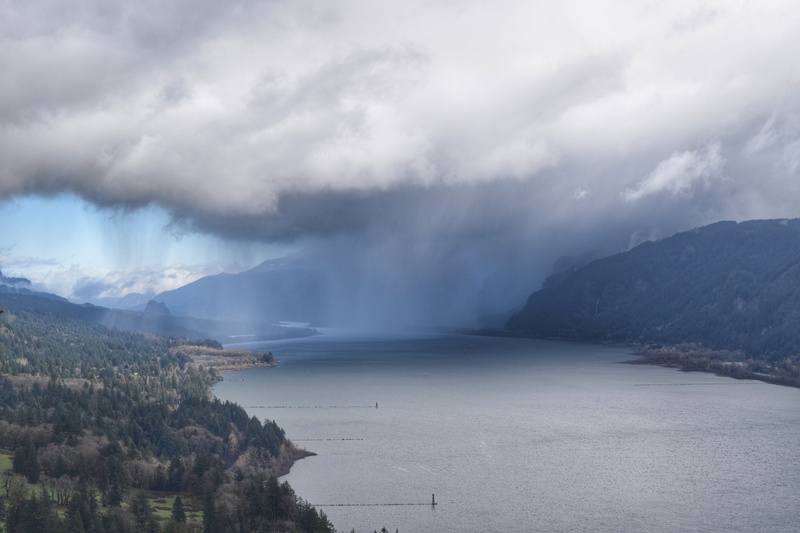 Check out the storm clouds from the Cape Horn Lookout. I wanted to climb Beacon Rock, but the trail was closed for maintenance. What?! 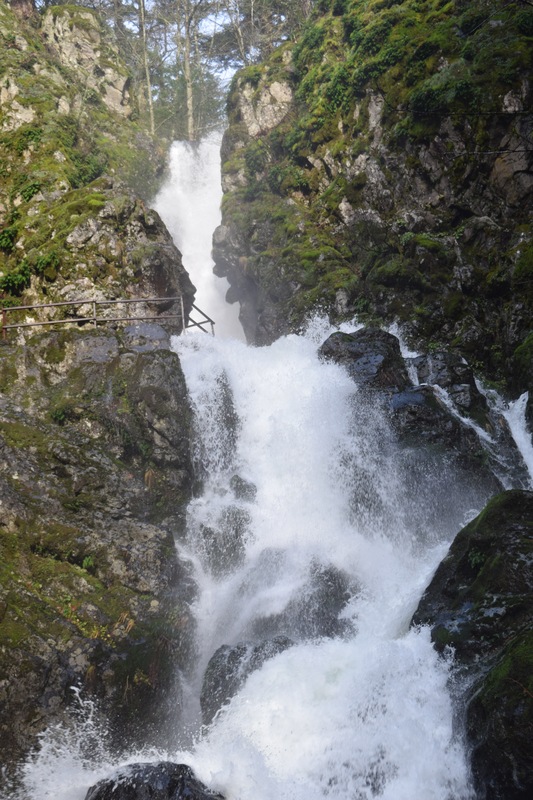 So I ended up hiking to Hardy Falls and Pool of the Winds instead. It’s been really wet lately, and the falls were quite spectacular. I also drove into Stevenson, our future home, to check out their community Christmas tree. It was, umm, cute. Pretty small actually. I also stopped in the grocery store for a few items, and the checker was addressing the lady behind me by name and asking about her kids. How quaint. I guess that’s something we’ll have to get used to when we live there. On the way home I ran into a massive hail storm; that provided some excitement! I am currently drinking wine while Tara is making a beef and butternut squash stew. We are watching football and will put on The Walking Dead later. Yesterday I hit page 200 in my novel, not a bad feat considering I started out on page 30 a little over a month ago. I am not that far away from the home stretch, which makes me want to keep banging away at it. So people are getting excited around here because the National Weather Service mentioned the “S” word. As in, snow. They’re predicting that just in time for the morning commute tomorrow, but it’s doubtful that anything will stick unless you get up into the foothills. There’s a better chance of snow and/or freezing rain later in the week, and that offers a little more promise. We shall see. For all the times they predict snow around here, it rarely materializes. We just don’t live in the right climate for it, so everything has to come together perfectly. Regardless of whether it actually does end up snowing, it’s going to be cold this week. Highs in the 30s. We haven’t had temps that low in quite awhile, so it’ll feel especially frigid for those of us more used to a damp 48 degrees. The best tamales I’ve ever had we bought during OUR garage sale. Some lady had them in her trunk. LOL. I bought some the other week from one of Perri’s schoolmate’s softball team. That was an easy pre-Thanksgiving dinner one night. See, everybody keeps telling me similar stories. I have to go back and find this woman now! That was an action packed weekend. LOL on Stevenson…..yup, you’re gonna love it there! Since when do you drink vino? Oh, you thought I was only a Bloody Mary guy? Go ahead and call me a Renaissance Man, my friend. I’ve been drinking wine for years, though I’m pretty picky. My current fave is any Sauvignon Blanc from the Marlborough region of New Zealand. Texas street vendors offer up the best Tamales ever, I mean ever. I think you should have bought the shirt, not so sure of the jacket though. Oh, and I forgot to mention the white patent leather shoes. I could put together an entire Cousin Eddie ensemble! Bwhahahahahhaha! Mark, that slayed me! 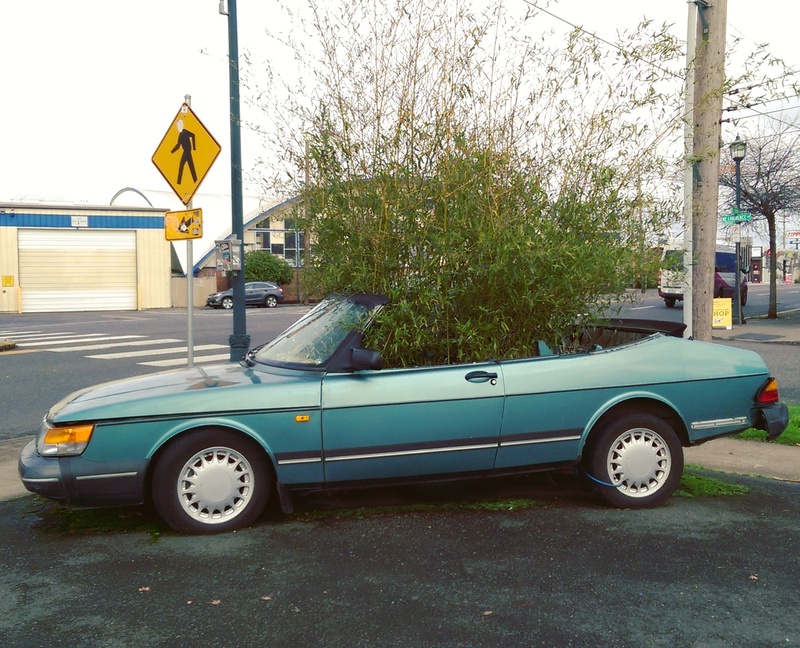 And it took me a minute to actually see that the tree was INSIDE the car because when I first looked at the photo, I thought the tree was on the SIDE the car. Your meal from scratch sounded DElicious! I love Mexican food! Both your photographs are freakin’ stunning; especially the one of the storm clouds. WOW! Have a grrrrreat week, buddy!